Yesterday at 1:47 p.m. EST, NASA successfully launched a rocket from Cape Canaveral, Fla., carrying the Deep Impact spacecraft toward its rendezvous with a comet. The mission's payload is a refrigerator-sized spacecraft carrying observational equipment and enough weight to slam into comet Tempel 1 and create a noticeable impact. The resulting crater  if there is one  will provide a first look inside a comet that scientists think may be representative of the early building blocks of the solar system. 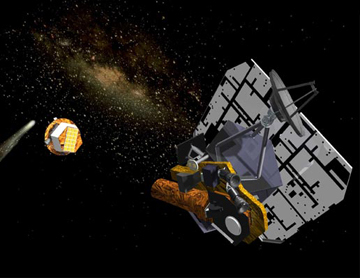 This artist's rendition of the Deep Impact spacecraft shows it releasing its impactor, in preparation to collide with comet Tempel 1 (to the left in the background). The courier spacecraft is powered by solar panels and will take high and medium resolution images and collect infrared spectroscopy data. Courtesy of NASA/JPL. "We don't know exactly what we're hitting. It could be something from fluffy snow to solid ice," says Jay Melosh of the University of Arizona. "We're poking the planet" to see how it responds, he says. If it is fluffy, the spacecraft would disappear for a few moments, and then blast out ejected material from the impact. "On the other hand, if it's a solid chunk of rock, we'll see a hemispherical crater immediately and it will grow out in size," says Melosh, who has modeled larger impact events, including the hypothetical meteor impact that triggered the Cretaceous-Tertiary mass extinction. That impact 65 million years ago was much larger than the one that will take place in July on Tempel 1, which is about 6 kilometers long and highly elongated in shape. In cross-section, it is rectangular and estimated to be just over 2 kilometers wide. As the Deep Impact spacecraft approaches, it will launch the impactor toward the comet, timed for a collision on July 4. The resulting fireworks, so to speak, will be documented by the carrier spacecraft, which will collect spectrometry data and visual images. The impactor itself weighs about 800 pounds, fortified with copper for extra heaviness, and measures 1 meter by 1 meter. It carries observing equipment to capture its last moments as it approaches the comet, just before its crash. Members of the research team, with scientists hailing from the Jet Propulsion Lab in Pasadena, Calif., the University of Maryland, College Park, the University of Arizona, Tucson, and elsewhere, have tested the impactor's autonavigation system to the point where they are confident of a less than one percent chance of missing Tempel 1. Aimed at the brightest side of the comet for the best viewing, the impactor could create a crater the size of the Roman Coliseum. No explosives will be necessary for the final impact, according to Lucy McFadden of the University of Maryland, an astronomer and co-investigator on the Deep Impact team. The object's mass and motion will be enough, as it gets "run over" by the comet's center of mass (at a relative velocity of just over 10 kilometers per second, which is well over 22,000 miles per hour). How the crater forms "tells us about the nature of the comet," said Michael A'Hearn of the University of Maryland. Experiments at NASA Ames Research Center in California used a vertical gun to shoot a variety of pellets into different targets, "to understand scaling relationships between the final crater and the pellet we put in," he said at a press conference in December. The speed, mass and density of the impactor and its target might affect the resulting crater. And the pattern of how the crater's ejecta falls will indicate the materials' density, or whether they are solidly compacted ice, loose sediments or hard rock  or some combination. Most objects that stream past Earth come from the Kuiper Belt and the Oort Cloud, concentrations of small objects that ring the solar system and probably the source of meteors that bombarded Earth in its early history. Knowing the composition of one of these objects (comet Tempel 1 is probably from the closer Kuiper Belt) will allow scientists to further refine how they think about the comets' contributions to Earth's composition  and possibly to the history of life on the planet. Melosh says that Deep Impact will not be able to answer these questions completely, but is a small step toward getting information on its components. "We need a sample," he says, which might be returned by future missions, such as Stardust. The Deep Impact mission, which cost over $300 million for the launch and spacecraft, has taken about five years to come to fruition. The impact will make Tempel 1 brighter than usual, and NASA is asking amateur observers to watch the impact event in July and share their observations online. Once the actual collision occurs, "we expect to be surprised," Melosh says. "The pictures are going to come back, and we're going to say 'what is that?!' It will probably be something totally unexpected."